This card was made on request.My manager wanted to gift his dad something of sentimental value on his birthday. He asked me to make a card for his dad.Since it would be customized, he knew i would ask him for little details about his dad. His likes, dislikes or anything that would give me a fair idea of what to make. But my manager remained tight lipped!! He said, "Look at how much work I have. You make something for a dad. That's a clue simple enough!" So he left me to figure out, how to make his dad happy with a sentimental touch. Since i had not more than 2 days for this task, i set my thinking wheels rolling. A father-daughter relation is a fragile one, made of unlimited love, care, warmth and open affection. Whereas a father-son relation gets a little on the sturdier side. A father is like a manager to the son. Mentoring all through life and driving the son to the zenith of success! But when it comes to emotions, both of them get tongue tied!!! So through this card i have tried my best to portray a son's feelings! A closer look at a father-son poem that i wrote! I hope you liked it. The pics are not that great coz i had to click them at wee hours in the morning before leaving for office!!! Wow, this is so cool! I love the bright colors and all of the folds! Thanks for playing along with Crafter's Companion! Nice Card, i can imagen how hard it was to create that! thanks for sharing wiht bastel-traum.ch, Tom. 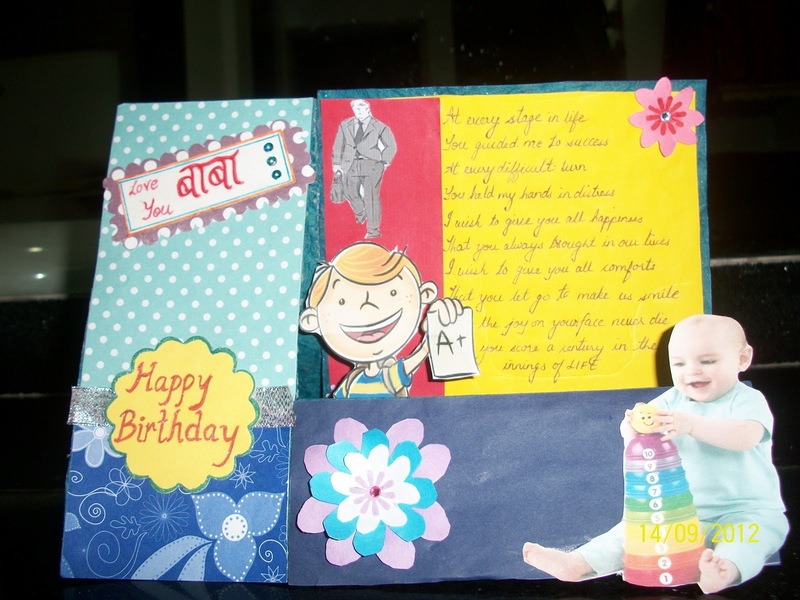 thats a cute card..Thanks for playing with Catchy Challenges..all the best.. Very cute card! 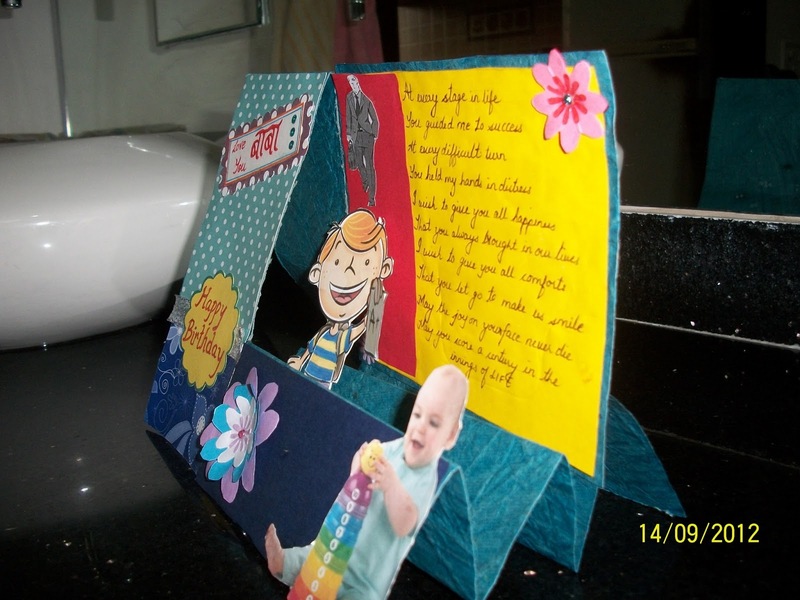 Am sure your dad would love this beautiful handmade card! Nice card and lovely concept of showing 3 stages. Lovely card !! I really liked the poem. Thanks for joining us at Lulupu's challenge #12 - My First Love,My Dad. Lovely card and I am sure your manager as well as his dad would love this one.I love the way you put so much thought into it and I can see that this creation is straight from your heart.Thanks for playing along Lulupu's Challenge #12 - My First Love, My Dad. 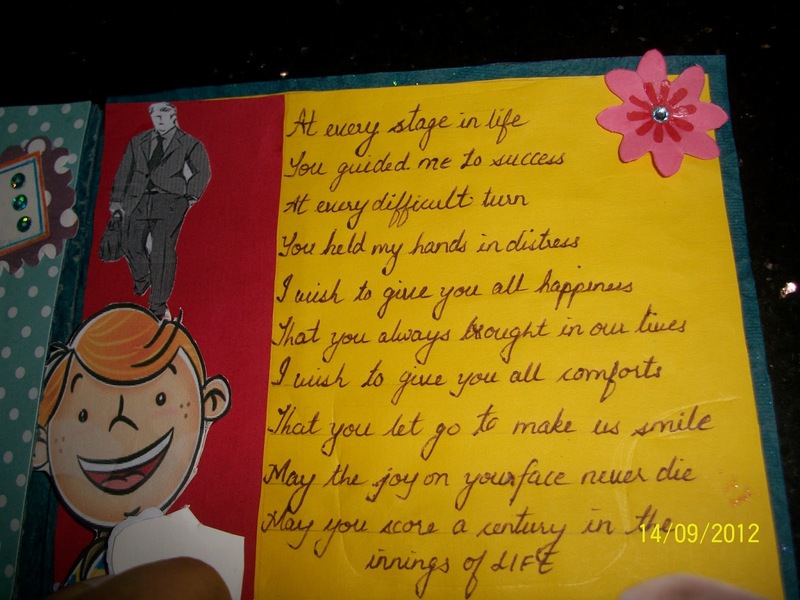 Love the details in the card,thanks for sharing at CATCHY CHALLENGES, all the best.